Suitable for terraces, balconies, carports, roof insulation, storage, etc. 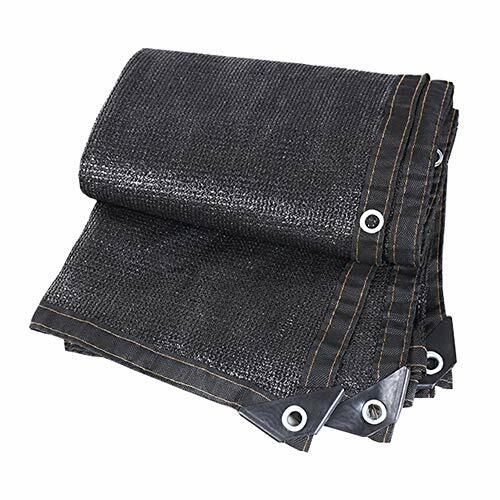 Since the fabric has different tensions in the warp and weft directions, it is normal to have a slight wrinkle on one side, and it will flatten out after sun exposure after the product is installed. The shade net is handmade and there will be minor errors, please refer to the actual product. The area of the shadow net is calculated according to the square, and the length * width is equal to the square number. Product delivery time is 10-15 days, if you do not receive the product within 30 days, please contact us as soon as possible. Made of high-density polyethylene, it is not easy to damage by adding anti-aging agent. The warp and weft are made of flat wire, and the light-shielding rate is high, which will not hinder the photosynthesis of plants. The trimming operation is first performed, the bidirectional line is designed to be more durable, the width is 4 cm, and every detail of the edge is handmade. While trimming, the protection of the four corners is enhanced. In addition to the holes at the four corners, a hole can be made per meter to facilitate the combination of the straps, tear resistance and durability. When covered, it blocks light and rain, keeping it warm and moisturized. Suitable for terraces, balconies, roofs, carports, factory warehouses, etc.